Are you a super detailed person who really likes to study the route? Well here you go. We’ve got a turn-by-turn detail on the Run Holden Beach route for you. You’re in for a real treat! 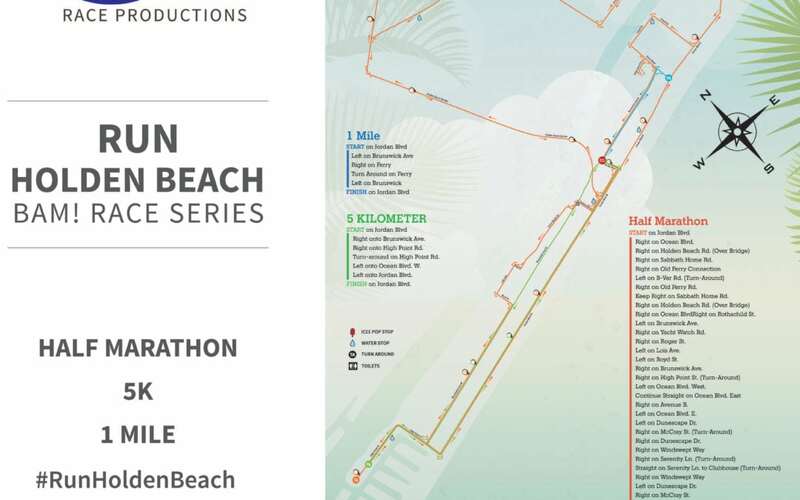 This is a beautiful course that starts out taking you off of the island for almost 5 miles of running on the mainland before crossing the waterway onto the island for an incredible finish. There are a few short turnarounds on this course but some absolutely amazing views. You’ll start and finish in the exact same spot (under the bridge on the island) with some BBQ, Beer and Pizza! So let’s dig into the details below. Don’t let the course directions scare you at all. We have an extremely well marked course, over 100 volunteers on the course, several officers, a bike lead, and lots of coning to keep you safe. *You’ll stay in the right lane all the way up the causeway leaving the island. Right on Sabbath Home Rd. Right on Old Ferry Connection Rd. Left on Old Ferry Rd. Keep Left on Sabbath Home Rd. Left on Holden Beach Rd. (Over Bridge) *Stay to your right on this road in the coned lane. Right on Yacht Watch Rd. Left on Ocean Blvd. West. Left on Ocean Blvd. E.